Kogan set tongues wagging last week when they announced a $230 handset with 4G LTE data connectivity, a 5-inch 720p display and running Android KitKat (4.4.2). It’s the Australian company’s first foray into the budget 4G handset space, a market that’s become a new battleground with entrants from heavyweights like Motorola, HTC and Huawei – and Kogan’s undercutting all of them. We were skeptical that the Agora 4G would be able to stand up to the competition, and we’ve been pleasantly surprised having spent a short time with the phone. The Agora 4G has only been available for a 48-hour loan period, which is why you don’t see the word “Review” above. Even so, we’ll try to give a good accounting of the phone for you – it just won’t be an exhaustive as a normal review. Considering the 5-inch display on offer, the Agora 4G isn’t as big as you’d expect. It’s only a couple of millimetres taller and wider than the Nexus 5, and for all intents and purposes it weighs about the same (it’s actually 5 grams heavier). The phone’s design reminds me of the Galaxy Nexus, with a shiny grey plastic frame around the phone with the glossy screen up front and a removable soft touch black cover on the back. Behind the rear shell, you’ll find a non-removable – but respectable – 2500 mAh battery, SIM and SD card slots and the speaker. Breaking with tradition for cheap and cheerful handsets, the phone’s not all blacks and greys. There’s a rather nice red accent that’s seen in the front earpiece, a metallic ring around the rear camera and the rear speaker. It’s pretty understated, and a pleasant change from the kind of phone design you often see in this class. The front is pretty unremarkable – up top you’ll find the red earpiece grille, front-facing camera and notification light, there’s obviously the screen, and below that there’s three capacitive buttons arranged in a Back/Home/Recent-Apps configuration. 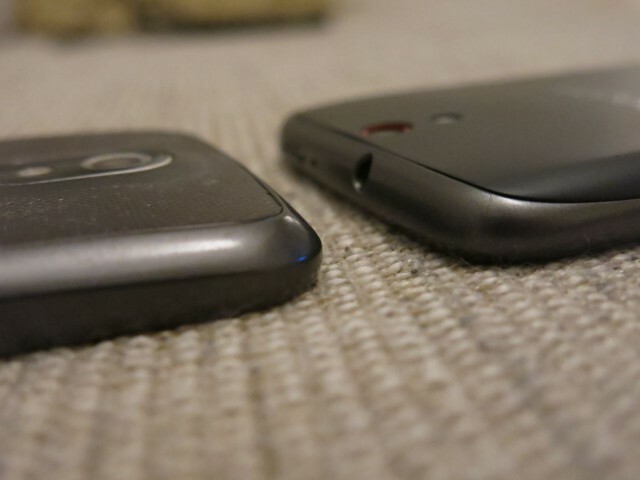 Buttons are a slightly nonstandard placement, with the volume rocker on the right of the phone and the power button to the left up top. To the right up top is the 3.5mm headphone jack, while the Micro USB port is in the centre of the bottom edge. The capacitive buttons take some getting used to – having used phones with on-screen buttons for nearly three years, now my thumb hunts for the back button somewhere around the bottom left of the screen. I also tend to push the volume rocker when I’m trying to turn the screen on, then have to remind myself of where the power button is. The Agora 4G comes with 8GB of onboard storage, expandable via Micro SD card. Of that 8GB, 5.5GB is available to the user for storage. It’s not a huge amount, and with limited support for moving apps to an SD card you might need to be careful what apps you install. All in all, it’s a pretty good-looking package for the price, and the curves on the edges give off a bit of a Nexus vibe – a comparison that isn’t hurt by the visual similarities with the materials used in the Galaxy Nexus’ construction. It’s not bad at all for a $230 phone. Taken face-on, the screen does its job. Don’t expect the world of the Agora 4G’s screen, and you won’t be disappointed. That being said, BenQ has made monitors for a number of years (I use one myself on my desktop computer) so I don’t expect them to deliver a bad display – and they haven’t. We’re looking a 720p display at 5 inches (320 PPI), which isn’t the lowest pixel density we’ve seen of late (that might be the Samsung Galaxy Mega, with a 6.3-inch display also running at 720p) and is in fact pretty respectable. Colours don’t really pop, and it does seem to have a fairly cool colour temperature – blues look quite blue, but otherwise colours are OK.
You’ll probably want to keep its brightness turned up a little more than on other devices though as it’s Next to a Moto G, it’s definitely darker even at maximum brightness, but without another phone to compare against you’d probably not notice this. It doesn’t generally have viewing angles, although this is a little dependant on what’s on screen. If you move off-axis you’ll find yourself looking at the light bleeding in from the edges pretty fast. There’s a 1.2 Ghz quad core CPU on offer, matched up with 1GB of RAM. It’s not a slouch, but it’s also no speed demon. Fortunately, KitKat sees Android perform much better on this spec of hardware than it did a year or two ago. In general use, the phone performs about as well as you’d like – you wouldn’t want to push it, but everything hums along pretty nicely. 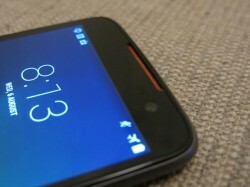 The device doesn’t benchmark too badly, coming out of an Antutu benchmark about the same as a Galaxy S III – again, considering the price this we’re looking at a pretty good result. Amusingly, Antutu says “Good job, welcome to the world of high-end smartphones” when it sees the Agora 4G. Benchmarks don’t tell the whole story, though. While the phone performs well in general use, it seems the internal storage isn’t particularly speedy – apps take a while to install after their download completes, and sometimes you’ll find yourself looking at a loading screen a little longer than you’d like. The speaker on the back of the phone is hiding a little bit of a secret – it’s actually pretty good, if you treat it right. It’s certainly good enough for audio to be heard clearly while playing a game, and it’s been pumping out the Transformers Age of Extinction soundtrack pretty well at near to full blast as I’ve been typing up this post with little to no distortion. It’s pretty genuinely surprising. 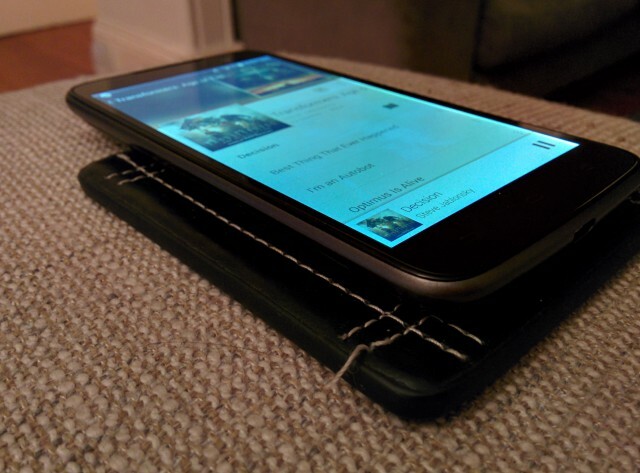 What I’ve found works best is to set the phone down face-up without muffling the rear speaker but without putting it on a completely solid surface. A coaster, and the armrest of my couch have both worked pretty well. The phone vibrates along with the music for the volume of the audio it’s cranking out, but that shouldn’t be too surprising. Believe it or not, this sounds fine. Unsurprisingly, the camera is one of the major trade-offs in getting a phone down to this price range. 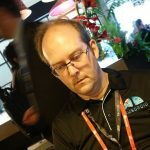 “Pretty good” very quickly comes down to “good enough” in component selection, and the Agora 4G’s camera doesn’t buck the trend. The 8MP rear camera is a pretty standard unit and has no optical image stabilisation, so it produces grainy shots in low light, and sometimes struggles to get focus right – although this might also be a result of some odd choices in the camera software. 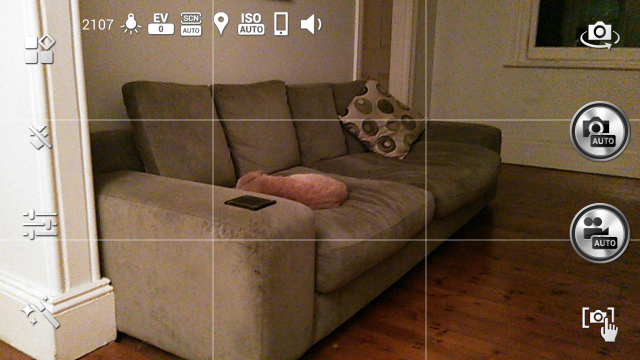 The camera UI by default performs a focus-and-shoot operation when you tap in an area on the screen, so you can’t focus and wait to shoot, although you can take a second shot with the shutter button on screen. This produces some dire results, entirely unbecoming of an 8MP camera. 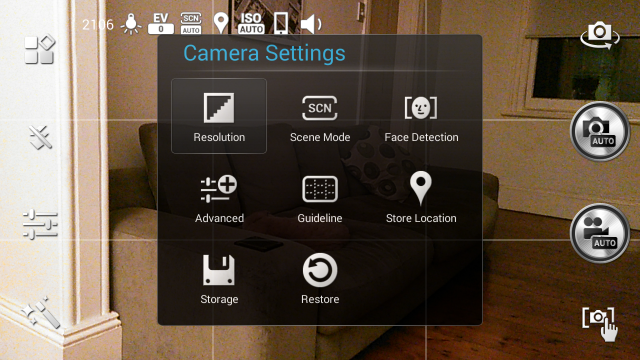 Otherwise, the camera software offers a decent number of shooting modes (including HDR), and lets you control things like Exposure, White Balance and ISO levels. Occasionally the camera software seems to get stuck in a particular shooting mode and you just can’t seem to change it. One setting seems to lock another, so before you know it the Tungsten white balance setting is locked in place and all your outdoor shots look particularly blue. This can be handled with a button that resets the camera settings back to their defaults, but really needs a fix (it’s happened twice while I’ve been testing the phone). In samples below you’ll see how grainy the camera can be, but none of this should be a shock. We’ve been comparing to the Moto G a lot, and its fair to point out that Motorola’s camera also disappointed although it also managed some nice shots in well-lit environments, as does the Agora 4G. The camera sometimes seems to pick up colours well as you’ll see in the shot of my desk, and other times they seem a little washed out as you’ll see in the flowers. Perhaps its down to the different lighting in those locations, but Auto mode is supposed to handle that. … but the results are still pretty grainy. Postboxes – colours came up nicely. Watch out for that … tree! Probably best not to use the flash. 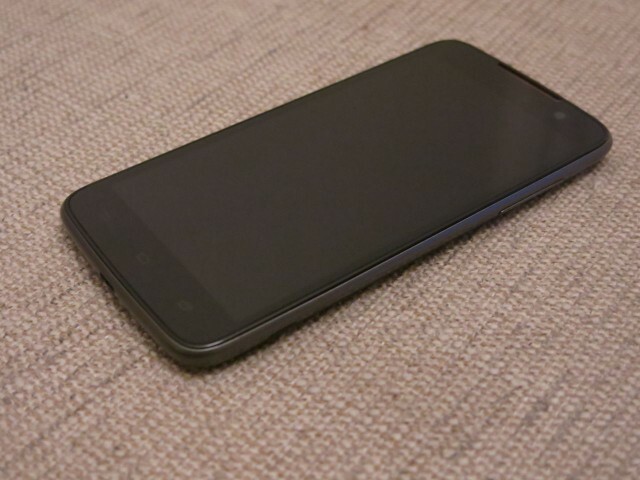 Kogan’s shipped a phone running near to the latest version of Android – it’s KitKat, but it’s 4.4.2. That’s pretty impressive for this class of device, although we’re waiting to hear whether Kogan intends to follow up with a 4.4.4 update – or beyond, with Android L on the horizon. What we’re looking at in general is a pretty close-to-stock (or close-to-AOSP, if you prefer) version of Android, with some tweaks. It’s the AOSP launcher, which I don’t think we’ve seen before – it does look like the updated visual design of Google Now launcher, it just doesn’t feature Google Now. Guess what? Quick Settings has been changed, and while it resembles Android’s “stock” design, it’s now editable with 20 tiles on offer that can be switched off if you don’t want them. What’s available? 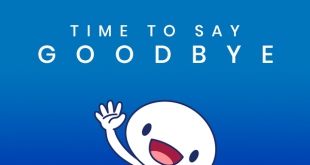 Settings, Battery, Wi-Fi, Mobile Data, Basic Volume (Ring/Vibrate/Silent), Rotation Lock, Bluetooth, GPS, Network Mode (curiously, 2G, 2G/3G or Auto – no 4G setting), Haptic Feedback, Brightness, Data Sync, Low Blue Light Mode, Screen Timeout, Location, Smart Connect, Flashlight, Airplane Mode, Reboot and Power Off. Once again, an OEM has outdone Google’s own Quick Settings with their own system. There’s a few things in the Quick Settings list that refer to some of the customisation that’s been performed on Android here. First of all, the Low Blue Light mode is a setting taken from BenQ’s monitor line which makes the screen emit less blue spectrum light, thought to decrease risk of eye damage, headaches and the like. In reality, this causes the whites on the screen to take on a progressively reddish tint and is probably something best left switched off. Smart Connectivity is a power saving mode that adjusts network connectivity based on your preference, if it’s switched on. You define “off-peak times” (which is when you’re asleep, really) a delay time before the control kicks in, and choose a mode – Regular or Aggressive. In Regular mode, in off-peak times when the screen is turned off, Wi-Fi and mobile data connections will be dropped after the delay time. Aggressive does the same thing but doesn’t care what times you’ve configured. It’s a similar approach to other manufacturers, but it’s nice to see some additional granularity to the controls letting users set the delay time and start/end “off peak” times. There’s one other trick that the Agora 4G has up its sleeve that made me sit up and take notice – it’s got double-tap-to-wake, which means the power button might well be in an odd place, but you’ll always be able to turn the screen on by double-tapping it. This is pretty impressive, as the LG G3 (like the G2 before it) and HTC One M8 are the only mainstream flagship devices this year to ship with such a capability. Well done to the Kogan and BenQ teams. Otherwise, we’re looking at a pretty basic Android installation here. There’s only a few additional apps bundled with the phone – a video editor, an FM radio app and a voice recorder. I expected to find many faults in the Agora 4G, but what I found instead is a respectable phone that delivers on its promise of being a quality Android smartphone at a decent price. The word “quality” probably deserves an asterisk in the previous sentence though, as there are obvious caveats in relation to specs, camera and the screen. Kogan’s comparisons with 2014’s flagships are somewhat foolhardy, but the company’s never been one to shy away from kicking over an anthill with its marketing. The Agora 4G isn’t designed to appeal to the people who can afford those high-end phones. If you use one, you’ll instantly find trade-offs you’re not prepared to make in the Agora 4G and that’s OK – you were never the target market. Personally I’d probably spend the extra on the LTE Moto G (which Kogan’s also selling for $239 plus shipping right now), but I’ve already owned a Moto G and many people who’ll be looking at the Agora 4G haven’t. As you move up from the budget price, you get what you pay for but if you need a modern Android phone with LTE connectivity and don’t have much money to spend, Kogan’s got a phone you should seriously consider. The Agora 4G is currently selling for $229 plus shipping from Kogan. It comes standard with a 1-year warranty that can upgrade to 3- or 5-years for $39 or $59 respectively. Shipping ranges from $19 (Melbourne) to $31 (Perth), depending on your location. See the product listing on Kogan.com.au for more details. 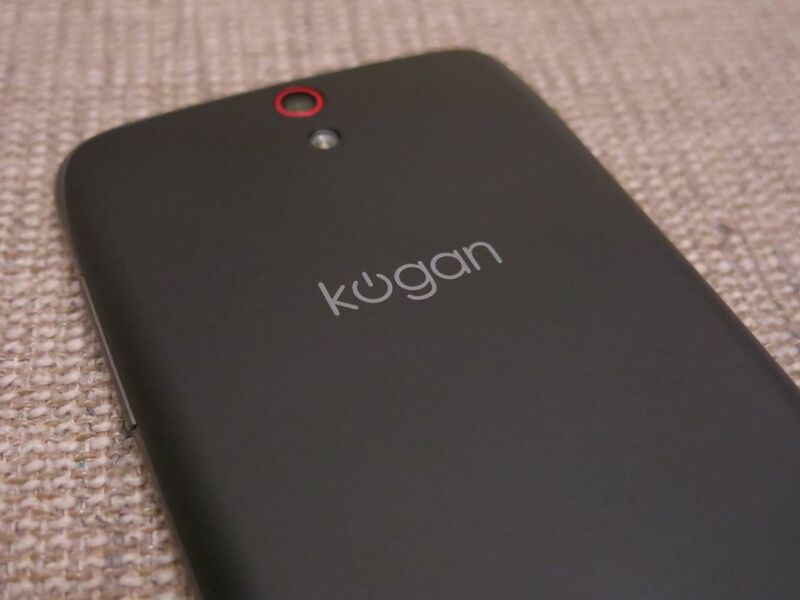 Are you considering the Kogan Agora 4G? Give us your thoughts in the comments! Reading the write up, it’s damn tempting to nab one of these. Jason, where were you when you got the pic of that cheeky rainbow lorikeet nabbing that tube of sugar? They should contact the Currumbin Bird Sanctuary and find out what to properly feed them, and set up some feeders nearby, but away form the tables.